Since it’s legalization in Canada, the need for cannabis safety awareness for the workplace has arisen. The employer is responsible to make sure every employee understands what cannabis legalization means for their workplace. Developing your own employee cannabis safety programs can be difficult. Now, you can save money, save time, and get everyone trained in cannabis safety awareness with our new course. 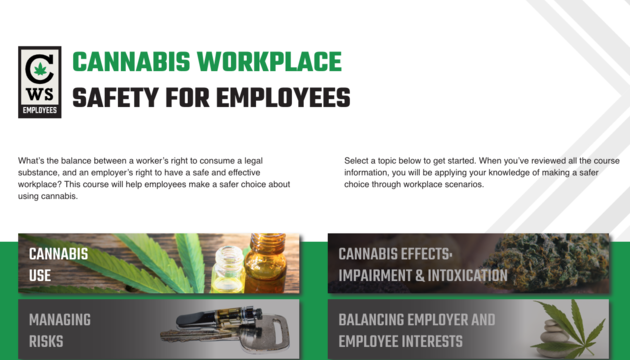 Our online course trains employees to understand the reasons for workplace cannabis policies, their rights as employees and their responsibilities. This course makes learning about cannabis safety easy with scenario-based lessons that engages the learner with easy to remember content. It is user friendly, self-paced and mobile-friendly.